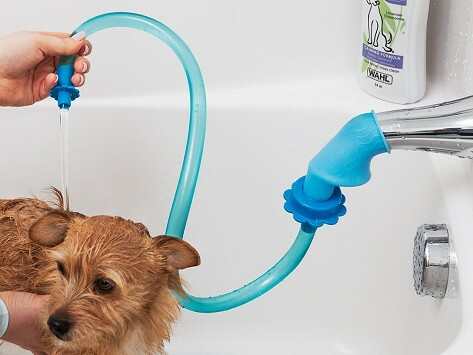 Slip on this pet shower sprayer to make bath time, cleaning the shower, and other rinse-off jobs easier and with less wet mess—no bucket needed. The stretchy, elastopolymer connector fits most shower heads and faucets and attaches to two three-foot-long hoses that can be disconnected to use more easily in the sink, or combined for a better fit in the shower. Dimensions (collapsed): 8" x 6" x 3"
It blew up all over me and my dog. Rinseroo’s rubbery elastopolymer connector can stretch up to ten times its size, so it easily slips onto just about any shower head or faucet to work as a hose attachment. It makes things like pet baths and bucket-fills easier and less splashy. And because there’s no installation needed, it can move around the house to do the jobs you need.